Spreading the collecting love, the 2018 Leaf Best of Sports checklist branches out to cover multiple sports in the hobby. However, "Best of" fans should still still recognize the format that yields one buyback and one Leaf insert per box. A frequent repackaged option from the company, 2018 Leaf Best of Sports continues the tradition of the many other sets that generally keep to one sport. Focusing on notable rookie cards of past and present, vintage offerings, autographs, and quality relics, the variety is further extended with coverage for "virtually every sport ever featured on trading cards." While Leaf buyback sets don't normally reveal a final checklist, the sell sheet teased basketball, baseball, football, boxing and soccer cards, including many rookie cards, autographs and graded editions. 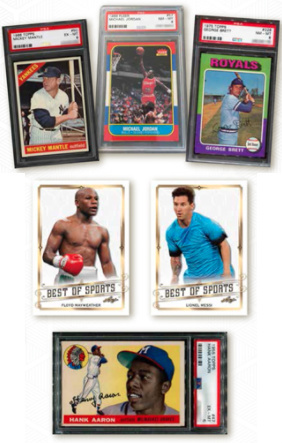 In addition to the buyback card found in each box, there is one original Best of Sports insert featuring all-time greats like Lionel Messi and Floyd Mayweather Jr. The overall 2018 Leaf Best of Sports production is limited to less than 300 cases (or 3,000 boxes). POP 1 PSA 10 DEREK JETER TRIBUTE AUTO #D 10 AMAZING 2018 TRITUTE TO DJ HOF ? 18 cards. 1 per box.